Otkritie Arena is a home stadium of Spartak Moscow. The stadium capacity is 45 360 visitors. The stadium is renamed to Spartak Stadium for the official games of the Confederations Cup 2017 and World Cup 2018. Ceremony of the first stone of stadium foundation was held on June 2, 2007. On February 19, 2013 was announced that according to the 6-year contract with Otkritie Bank the stadium would be named Otkritie Arena. A monument to Starostin brothers was placed next to the pitch near Stand B August 21, 2014. Stone monument of a gladiator on a 24,5-meter pedestal was installed in the front of the stadium. The opening ceremony of Spartak metro station was held on August 27, 2014. On August 30 eight thousand of visitors gathered together at the stadium to watch Spartak veteran match. 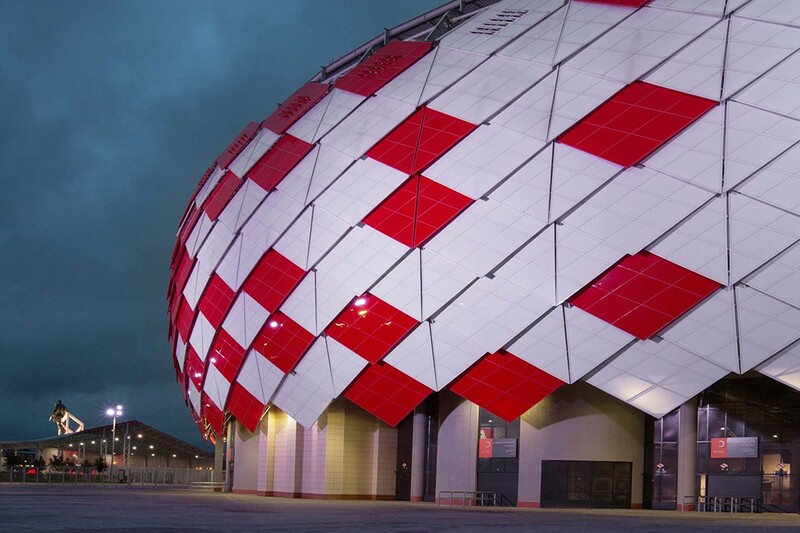 On September 5, 2014 the stadium hosted an opening game between Spartak Moscow and Red Star Belgrade. 37 734 fans visited the game. Spartak Moscow defender Dmitriy Kombarov scored the first goal at the new stadium. On September 14, 2014 Spartak won in a game against Torpedo Moscow (3:1) in the 7th Round of Russian Football Premier League 2014/15. Two goals were scored by Quincy Promesand one by Jose Jurado. 36 058 visitors watched this game from the Stands. Team Russia played its first game at Otkritie Arena on October 12, 2014. National team tied the game with Moldova (1:1) in the European qualifiers.